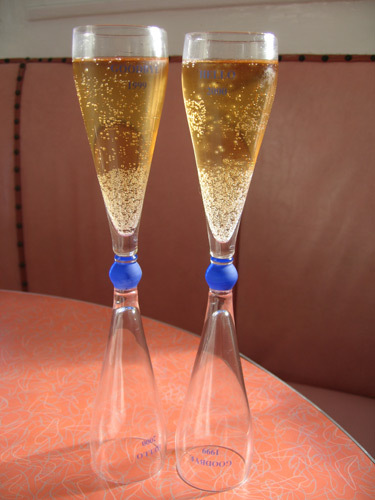 Featuring two sides, one to toast the year about to end and the other to toast the new year once it arrives, these glasses were made to usher in the new millennium in 2000. 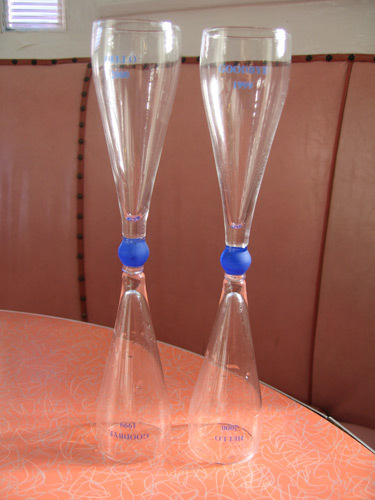 I don’t usually collect glassware this new but these are so odd and New Yearsish as to become Kitsch. 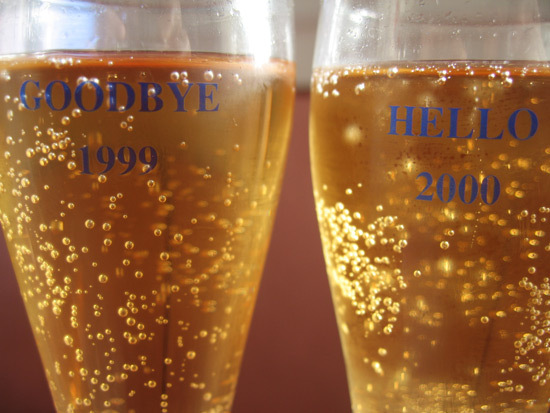 Happy last day of 2009 and I’ll see you on the other side! 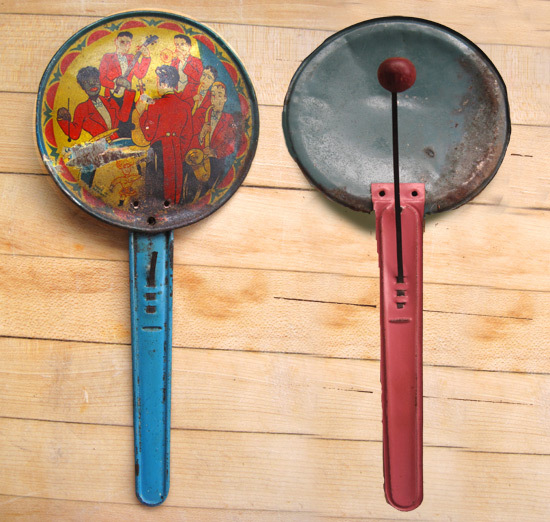 Battered and rusty, this vintage 30′s noisemaker still exhibits signs of life with a great hardwood-ball-against-tin sound that I still use as percussion on a lot of my songs. I suspect that the artist who did the graphic didn’t know a lot about music though as this is quite a peculiar figuration for a jazz combo. Sans piano and bass, there’s but a guitarist and drummer accompanying the three-piece horn section, the middle horn of which looks more like the end of a hookah than the trombone it probably should have been. I also love the little muscle man with the A-bomb afro hovering under the band, stylistically completely inconsistent with the rest of the figures. All of which means this noisemaker firmly hacks a deep notch in the belt of Kitsch. These were all the rage among crafters in the 1950s and continue to bring joy to Kitsch lovers who don’t like staring at plain wine or liquor bottles. Most popular canine colors were white, gray and black. They usually came with accent color noses and button or rhinestone eyes, in this case both. 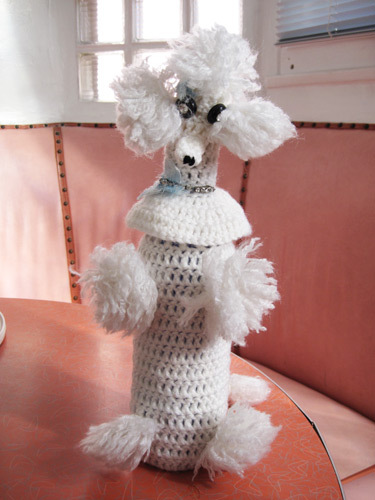 If the crafter was very industrious Fifi also had knit or felt red lips and a jeweled collar. 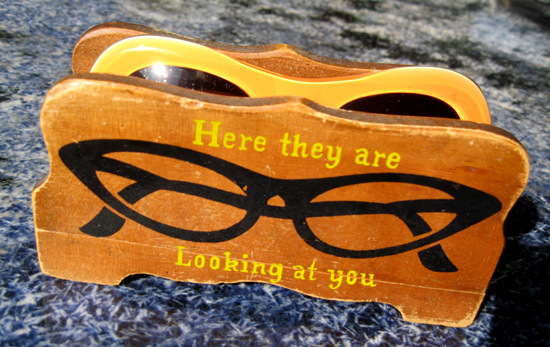 These eyeglass holders became all the rage in the 1950′s when fanciful designs transformed a lot of otherwise mundane looking products like eyeglasses and the receptacles they sat in into little gardens of kitsch. I always enjoy wearing glasses more when I pull them out of something like this. 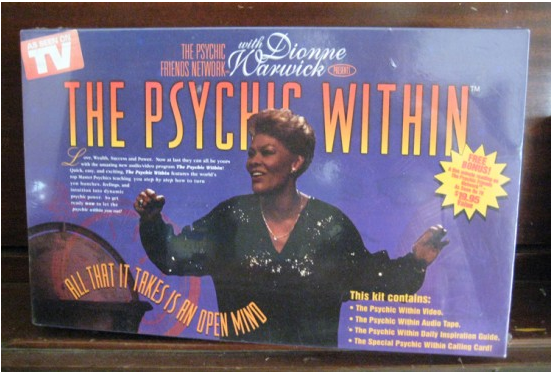 With 2010 only inches away I wouldn’t mind a little psychic vision as to what the coming year will hold. Would love a few more coins dropping in the pocket, a few more hits rolling out of the brain and a whole lot more kitsch kluttering up my life. 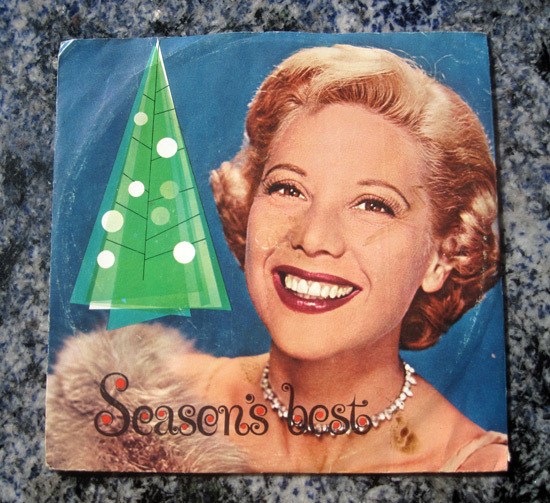 “Seasons best” from Dinah Shore, Chevrolet and me! Dinah warbled “See the USA in your Chevrolet” throughout the Atomic Age when the auto maker sponsored The Dinah Shore Show from 1956–63. The jingle became her best known song and kept her working steady so she could afford lots of Christmas and Hanukkah presents. This is the only version of this festive holiday treat (or torture, depending on how you look at it) that I can stand having in my house. I would sooner eat this plastic version than the real thing as fruitcake is one of those things that my tongue has never adjusted to. 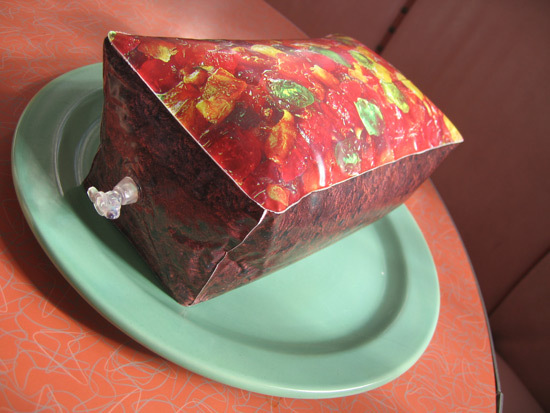 Made by Accoutrements and billed as “the fruitcake they’ll actually want to eat”, the package includes everything you need to send the flatter-than-pancake thank-God-it’s-not-real fruitcake to those you love (or hate) this holiday season. 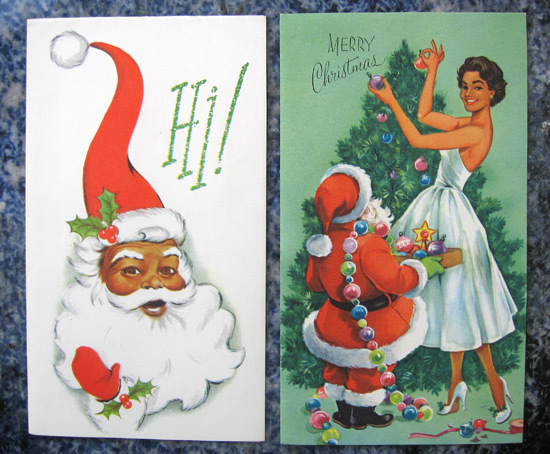 This “Imperial Collection” of African American Christmas cards was a rarity in the 1950s, hard-to-find among the rows of their Caucasian counterparts on drugstore and card shop shelves. Other than the depictions of Black Santas and elegantly garbed Ebony Classic ladies, these cards are especially generic with greetings like “Taking time out to stop and say: “Hello there! And hi! Merry Christmas and a happy and bright New Year!”. Everybody knows that the holidays induce stress, especially this year with the economy still sitting out on the sidelines. 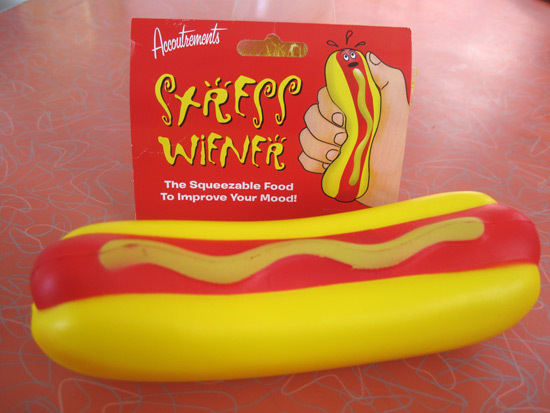 So just in time comes the Stress Wiener, “the squeezable food to improve your mood”. If I were the gambling type, I’d lay odds that this was a repackaged dog toy that came from the factory minus a squeaker. Whatever the case, I’m squeezing it hard with only three days left til blast-off. It says a lot about the Atomic Age that America’s pre-Kennedy First Family, the Ricardo’s, hawked cigarettes for the holidays. Now we know why Lucy’s voice was lower than James Earl Jones’ as she progressed through the years most likely puffing on her lifetime supply of Phillip Morris.